Nostril HobbitsPicture this: You’ve just sat down down to a lovely meal of pork tenderloin covered in a fabulous mango chutney. Pop goes the cork on a bottle of Pinot Gris and you fill your glass a third of the way, swirl, and sip. Perfection. Then you grab the remote and turn on the TV. It’s 20/20 and you feel like a very informed citizen as you prepare to learn about Chinese oppression in Tibet. After the first segment, the commercials roll in. Then there, on the screen, is a giant, gelatinous blob of green. No, you have not sneezed on your television set. You notice the blob is wearing blue jeans and a white t-shirt stretched to the limits. He is watching TV in a little circular living room. Then the camera zooms out and shows someone blowing their nose and you realize the blob is a snot goblin that is living inside your nostril, and his name is Mr. Mucus. You then proceed to wiggle around a particularly gooey chunk of the mango chutney on your tongue with a nauseous sensation growing in your belly and spit it out in your napkin. What the crap?! Is this really necessary? Do we really have to personify illnesses now in order to sell drugs? And I thought the rapidly read drug side-effect list – which sounds like it was developed for an SNL sketch – was bad. 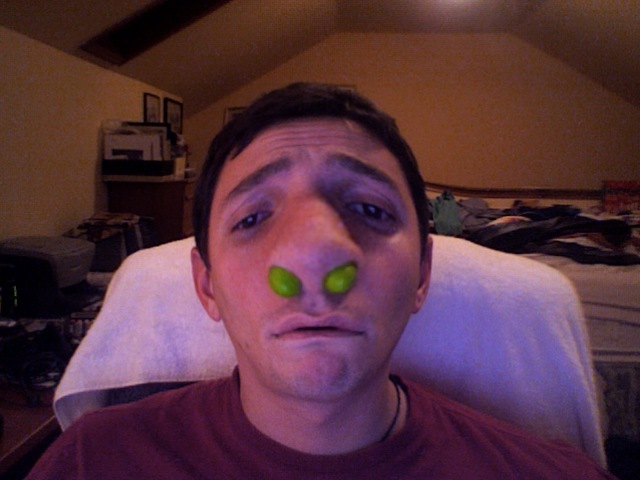 This Musinex booger boy is just part of a disturbing trend though. First it was Digger, the “dermatophyte” who told you he lived beneath your nails and who after introducing himself proceeded to spin into a whirling dervish and burying himself into your flesh. Now don’t you want some Lamisil – now that you know you have a colony of creepy little creatures partying underneath your nails? Honestly, what’s next. Are we going to be looking forward to the following commercial characters one day?! Preperation H – Meet Harry Hanger and the rest of his red-headed family of ornery hemorrhoids. Pro-activ – Say hello to Poppy Whitehead, the curmudgeonly blind zit that lives under the skin of your pockmarked chin. Exlax – Introduces Pluggy, the quirky five-pound colon blocking turd.